The British Virgin Islands comprise about 50 small Caribbean islands; around 15 are inhabited. They are located a few miles east of the U.S. Virgin Islands. The North Atlantic Ocean lies to the north of the islands, and the Caribbean Sea lies to the south. The largest islands of the group are Tortola, Virgin Gorda, Anegada, and Jost Van Dyke. 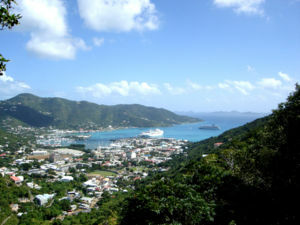 Road Town, the capital and largest town, is situated on Tortola. The British Virgin Islands is highly dependent on tourism, which accounts for 45% of national income. The islands are a popular destination for U.S. citizens, with around 350,000 tourists visiting annually (1997 figures). Tourists frequently go to the numerous white sand beaches, visit The Baths on Virgin Gorda, snorkel the coral reefs near Anegada, experience the well-known bars on Jost Van Dyke, or charter yachts to explore the less accessible islands. Substantial revenues are also generated by the registration of offshore companies. As of 2004, over 550,000 companies were so registered. In 2000 KPMG reported in its survey of offshore jurisdictions for the United Kingdom government that over 41% of the world's offshore companies were formed in the British Virgin Islands. Since 2001, financial services in the British Virgin Islands have been regulated by the independent Financial Services Commission. The economy is closely linked with that of the larger U.S. Virgin Islands to the west, and the islands' currency, since 1959, is the US dollar. More information on politics and government of the British Virgin Islands can be found at the Politics and government of the British Virgin Islands series. Executive authority in British Virgin Islands is invested in The Queen and is exercised on her behalf by the Governor of the British Virgin Islands. The Governor is appointed by the Queen on the advice of the British Government. Defence and Foreign Affairs remain the responsibility of the United Kingdom. The Constitution of the Islands was introduced in 1971. The Head of Government is the Chief Minister, who is elected in a general election along with the other members of the ruling government as well as the members of the opposition. An Executive Council is nominated by the Chief Minister and appointed by the Governor. There is a unicameral Legislative Council made up of 13 seats. The current Governor is David Pearey (since 2006). The current Chief Minister is Orlando Smith (since June 17, 2003) who is a member of ruling National Democratic Party (NDP). The main opposition is the Virgin Islands Party (VIP). The Islands were first settled by Arawak Indians from South America in around 100 BC. They settled the Islands until the 15th century when they were removed by the more aggressive Caribs, a tribe from the Lesser Antilles islands, after whom the Caribbean Sea is named. In 1493, The Islands were sighted and named by Christopher Columbus on his second voyage to the Americas. The Spanish Empire acquired the Islands in the early 16th century, mining copper on Virgin Gorda. The Dutch established a permanent settlement on Tortola in 1648. In 1672, the English arrived in the region, and annexed the Islands, removing the Dutch populations from Tortola in 1672, and from Anegada and Virgin Gorda in 1680. The English introduced sugar cane to the Islands, which was to become the main crop, and source of foreign trade. Slaves were brought from Africa to work on the sugar cane plantations. The Islands prospered economically until the growth in the sugar beet crop in Europe and the United States significantly reduced sugar cane production. The English, Dutch, French, Spanish and Danish all jostled for control of the islands for the next two hundred years; the final act seeing the English oust the Dutch and gaining a permanent foothold in Virgin Gorda and Tortola. By the 1600's England had ended up with Tortola, Virgin Gorda, Anegada and the other islands that make up the present day BVI and the Danish had the other Virgin Islands (St. John, St. Thomas, St. Croix). The BVIs were more strategic than anything else for the British, but were planted when economic conditions were particularly favourable. In 1917, the United States purchased St. John, St. Thomas and St. Croix from the Danish for US$17 million, renaming them the United States Virgin Islands. Subsequently, the British renamed the islands they controlled as the British Virgin Islands. The Islands were administered variously as part of the Leeward Islands Colony or with St. Kitts and Nevis, with an Administrator representing the British Government on the Islands. Separate colony status was gained for the Islands in 1960 and the Islands became autonomous in 1967. Since the 1960s, the Islands have diversified away from their traditionally agriculture based economy towards tourism and financial services, becoming one of the richest areas in the Caribbean. The population of the Islands is around 21,730 at 2003. The majority of the population (83%) are Afro-Caribbean, descended from the slaves brought to the Islands by the British. Other large ethnic groups include those of British and European origin. The largest religion is Christianity, of which 33% are Methodist, 17% Anglican and 10% Catholic. Being a small group of islands, transportation is limited. There are 113km of roads. The main airport is located on Beef Island, near Tortola. Virgin Gorda and Anegada have their own smaller airports. The main harbour is in Road Town.